Like any garlic, I suppose, this one gets you a seat in the library on your own if you eat enough. 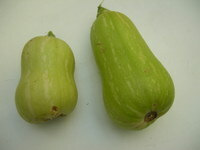 It's a hardneck type on the smallish side but still producing 10 plump cloves that deliver a strong taste. Combined with olive oil and pimenton it did a good job of marinating chicken breasts. This is a hardneck marbled purple stripe variety though you'd hardly guess looking at the outer skin. Coming from Russia as the name suggests it's supposed to do well in cold climates. 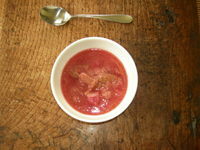 The inner skin of each clove, 8 in all, is reddish purple and cooks will like it as they are large and easy to prepare. I've read that hardneck garlic doesn't store as long as softneck varieties and this one has a life of 5 - 7 months. Time will tell. As I've more hardneck varieties this year maybe I'll experience a 'hungry gap' when I've no garlic left in store. Hope not. Taste? Garlicky and it livened up a roast hand of pork. 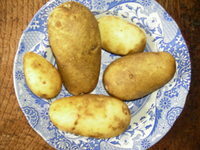 These are the first potatoes out of the garden this season. I'd be lying if I pretended they were early earlies - I don't expect to be eating my Home Guard much before end of May or early June. These were left overs I missed from last years harvest (quite how you can miss fairly large spuds is a mystery) and they stored in the ground pretty well until I dug over the soil this weekend. 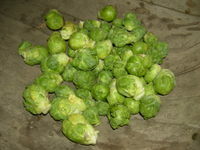 This is one of the first winter vegetable harvests of the season - good old Brussels sprouts. I've already had some leeks off the allotment and snuck a parsnip earlier in the month but they go with colder weather than we are having at the moment. I think this is Seven Hills but I'll need to check. Some of the buttons are a bit small, others slightly blown but I'm looking forward to them. BPs are one of my favourite vegetables despite my mother boiling them to death in ham water. I'm surprised I wasn't put off for life. Now it's 5-6 minutes in boiling water, drain and serve plain (a knob of butter and some salt if you're allowed). Cooked this way they'll retain their colour and bite. They'll join some baked leeks this evening and roast Charlotte potatoes to go with grilled chicken breasts. I sense good things about to happen. I've several plants of Red Rubine in the ground as well but they are taking a long time to develop. Will they retain their colour when cooked? I wonder if these butternut squash will ripen like the green San Marzano tomotoes I ripened on the window sill? They are not at all like the buttery shop varieties. The books I've read all talk about letting the squashes ripen in the sun on the vine. What are the chances of these unripe looking fruits ripening indoors?